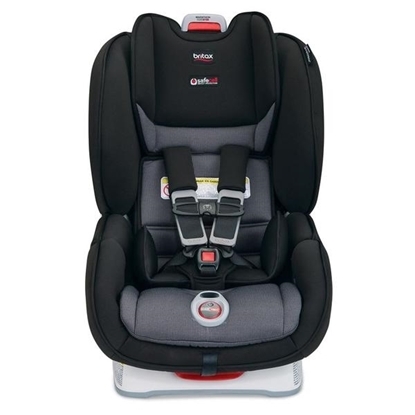 The Marathon ClickTight Convertible Car Seat is an excellent choice for getting your family where they need to go safely, comfortably and with ease. With the ClickTight Installation System, now everyone can install the car seat securely and confidently by just buckling the seat belt. Plus, complete side-impact protection shields your little one in a deep protective shell designed to absorb crash forces and protect from debris. Accommodates children rear facing 5-40 lbs. and 0”-49” in height, and forward facing 20-65 lbs. and 0”-49” in height. 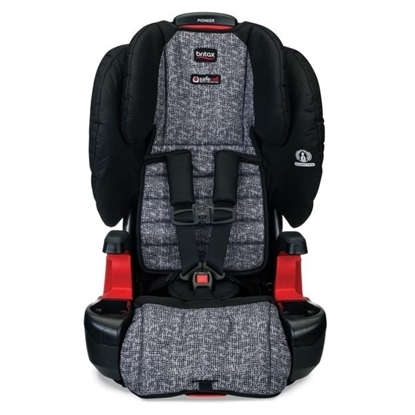 The Pioneer Combination Harness-2-Booster Seat is an excellent choice for making travel with your growing child safe, comfortable and hassle-free. Our comprehensive SafeCell Impact Protection surrounds your child in safety components that work together to protect well beyond the established federal safety standards. And Complete Side Impact Protection PLUS provides an advanced layer of protection with a protective shell and an energy-absorbing foam headrest designed to keep your child's head and neck extra secure. The Revolution Duallie Flex Stroller has a height-adjustable handlebar with nine positions to accommodate any parent with a perfect fit. A swiveling front wheel allows for superior maneuverability. Locks forward for increased stability while jogging or when the terrain turns tough. Easy, two-step folding, lightweight frame for convenient transport and storage. State-of-the-art, adjustable suspension system provides an exceptionally smooth ride. Plus, the Revolution Duallie Flex can hold two kids! Weight capacity: 100 lbs. total. The Revolution Flex Stroller has a height-adjustable handlebar with nine positions to accommodate any parent with a perfect fit. A swiveling front wheel allows for superior maneuverability. Locks forward for increased stability while jogging or when the terrain turns tough. Easy, two-step folding, lightweight frame for convenient transport and storage. State-of-the-art, adjustable suspension system provides an exceptionally smooth ride. Weight capacity: 70 lbs. Exploring can really work up your child's appetite; attach the Snack Tray so your child can snack and sip on the go! Easily and securely attaches with the BOB® Accessory Adapter. One sippy cup holder and tray carries drinks, snacks or toys. For Duallie BOB strollers. Exploring can really work up your child's appetite; attach the Snack Tray so your child can snack and sip on the go! Easily and securely attaches with the BOB® Accessory Adapter. 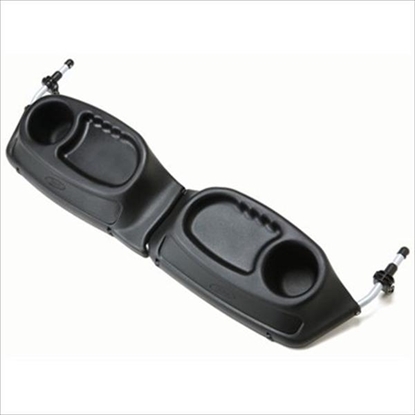 One sippy cup holder and tray carries drinks, snacks or toys. For single BOB strollers. 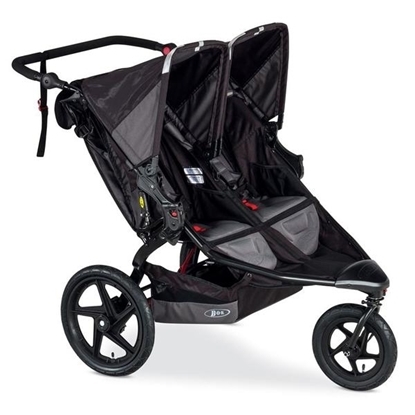 The Sport Utility Stroller makes it easy to include your child in your active lifestyle. 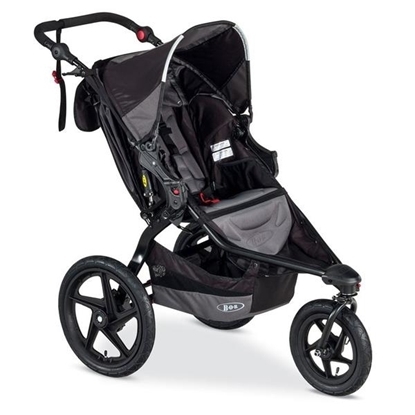 Bumpy trails, curbs, cracked sidewalks — they're all tough to get along with in other strollers, but a breeze with this one. 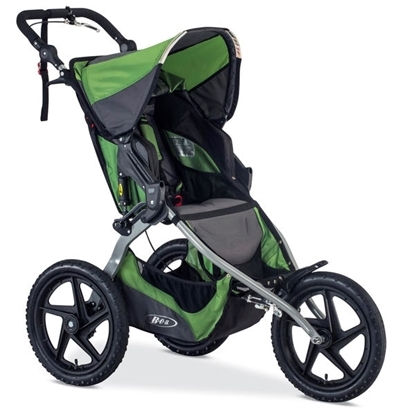 This stroller has 16" knobby tires for maximum traction, state-of-the-art suspension, a fixed front wheel that provides increased stability, and a sparkling personality that lets you show your baby the world on or off the beaten path. Fast, 2-step fold-up design for stow-and-go portability. Weight capacity: 70 lbs. 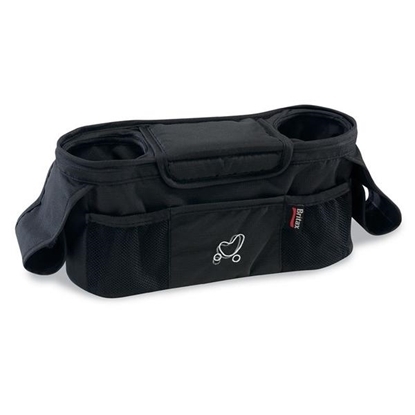 The Stroller Organizer provides convenient storage for all essentials. 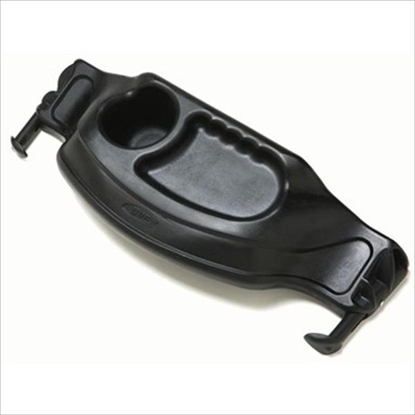 The organizer easily and securely attaches to almost any stroller handle. Two insulated beverage holders keep cold drinks cold and warm drinks warm. An internal frame provides structure and creates effortless removal and replacement of bottles or cups. The large center compartment features a magnetic closure that won't wake your sleeping baby when opened. Three outside pockets are easily accessible for small items such as cell phones or keys.